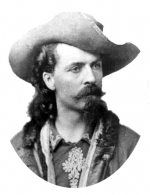 IN A WORD: William F. (Buffalo Bill) Cody earned his name as a hunter for the railroad, gained fame as an army scout, and became legendary as a showman. A man of vision, Cody also advocated equal rights for women and for his former Indian foes. He introduced new show business techniques and founded communities. He supported preservation of the buffalo and originated the modern rodeo. He was a product, a promoter and a shaper of the American West. THE RISE AND FALL OF ROME: At age 21 and with visions of making millions, Cody and a friend named William Rose decided to develop a town in Western Kansas and call it Rome. Once the news spread that a town was being created along the lines of the railroad, in less than a month over two hundred houses, businesses and saloons had been established. However, one day Dr. D.E. Webb, a representative of the Kansas Pacific Railroad arrived in Rome. Wanting to share in the profits of Rome, Dr. Webb offered Cody & Rose the idea of taking on a partner. Cody and Rose would have nothing to do with this suggestion, so Webb moved one mile down the road where he started the town of Hays City. 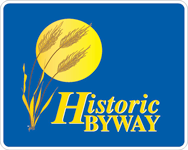 The new “residents” of Rome, thinking that they had built in the wrong place, pulled up stakes and within three short days all but one little store in Rome had moved to the now present site of Hays, Kansas . 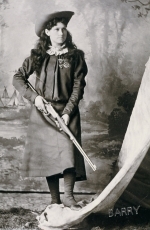 ANNIE OAKLEY: In 1881, a shooting competition was arranged between widely acclaimed professional marksman and vaudeville star, Frank Butler, and little Annie Moses. Not expecting a pretty girl in a dress to step out to the mark, Butler was instantly defeated and smitten. He later became Annie’s manager, coach, press agent, shooting assistant, and husband. This famous markswoman made history with her first performance before an audience of 17,000 people in 1885, and for seventeen years was the star attraction of Buffalo Bill Cody’s Wild West Show. THE GREAT BUFFALO: The destruction of the vast buffalo herd that once roamed North America took place between 1870 and 1883. This can primarily be attributed to hide hunters who received 50 cents to $1.25 for each skin. Cody was shocked by this practice and often spoke against it. By 1888 the buffalo herd owned by Cody for his Wild West Show was the fourth largest herd in the United States, consisting of only 18 animals. 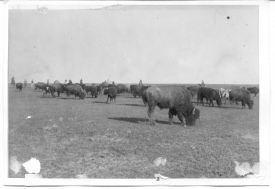 Many of the buffalo alive today are descendants of this herd. A FINAL WORD: No one symbolized the West for Americans and Europeans better than Buffalo Bill. He was consulted on Western matters by every American president from Ulysses S. Grant to Woodrow Wilson. He counted among his friends such artists and writers as Frederic Remington and Mark Twain. He was honored by royalty, praised by military leaders, and sought after by business tycoons.